ECIS 2014 | ERCIS Competence Center "Service Science"
We have entered an era where physical reality is increasingly entangled with digital representations. Even though we sit in a face-to-face meeting or classroom, we are checking our mobiles for texts, emails and Facebook posts, thus remaining in constant contact with distant others. Big data analytics is both helping us gain insight into our increasingly complex reality, but it is also constructing our world and our lives. And RFID and mobile technologies are creating “the Internet of things,” where inanimate objects now communicate with each another. 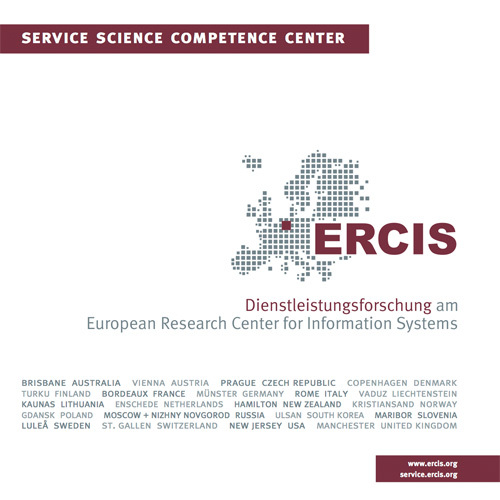 The ERCIS Service Science Competence Center is involved at ECIS by co-hosting the track on “Service Innovation, Engineering, and Management” (http://ecis2014.eu/wp-content/uploads/2013/07/20.-Service-Innovation-Eng...), for which Daniel Beverungen serves as a track chair. The IS discipline needs to advance research on phenomena related to IS as a service and IS-based services. Researchers and practitioners alike suffer from a lack of theory-rooted knowledge for engineering and managing services as well as leveraging IS for service innovation. At the same time, the advent and success of the service paradigm challenges previously established concepts in the IS discipline, such as the separation between corporate IS and consumer IS, or internal IS and external services. Service-focused research in IS thus needs to create and refine concepts, models, methods, and systems to reflect these developments.